I did it, y'all, I made a knit thing!! Yay! Everyone has made a Coco already, like years ago. I bought the pattern when it came out and even bought fabric and everything. It took me a few months to buy a twin needle, but I did. And then I let it sit for like a year because I was irrationally scared of knits. But I'm a member of the Stashbusting Sewalong 2015 facebook group, and when I heard that this month's challenge was "Face your Fears!" I knew that it was time for me to pull out that coral double knit I had bought and try something out. Tilly's Coco pattern was really easy to make on my regular sewing machine and I even used my double needle on the hem without incident. This Coco took me a few hours to make since I traced my pattern and everything (I made size 3--I am right between a 2 and 3 but I wanted to err on the larger size. The version shown here is totally unaltered), but I can see how this could be a really, really quick project. 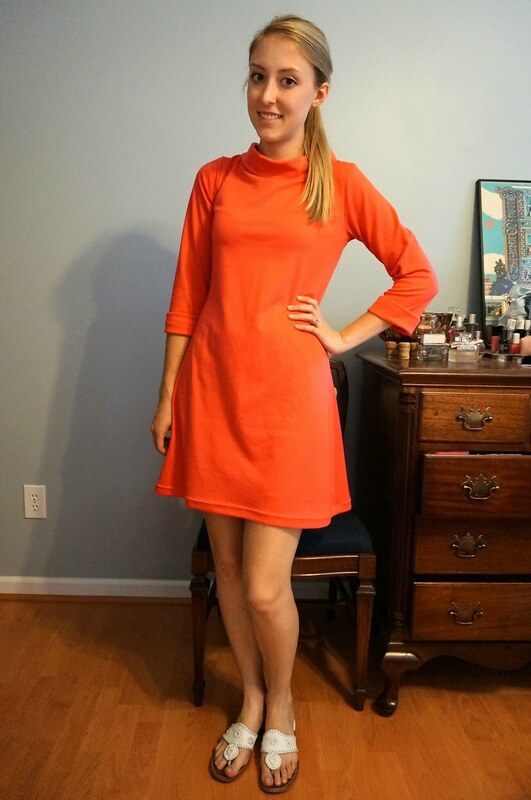 My fabric is showing up as very orange in these pictures, but it is not orange. It really is a coral-y pink! It was a double knit so it was fairly stable to sew, but I still wish it was a little less drapey. I think it looks better belted in this fabric. If it were more stable, it would have more of that triangle shape that Tilly seems to lovvvvve. Here I am trying to do my best Tilly pose (also seen in picture #1 up top). Wooster has no respect for blog photos. I really want to make the top variation, and do an old-school breton/mariniere version of Coco, but I'm looking for a really thick, stable, 100% cotton in stripes and having no luck. Does anyone have any leads on this type of fabric? What is this thick cotton even called? I'm about to just buy a Saint James and forget about sewing it at all! Finding fabric can be so frustrating, especially fabric that is common in RTW. Love it! What are you talking about with the fabric you are looking for? like a striped rugby fabric? Sort of, yes. A heavyweight jersey with a breton stripe? It looks great! Glad you faced your fears and made one, it really is super easy to put together. Finding breton striped fabric is so hard, I found some double knit from Fabric Godmother over here in the UK but I've not been able to find anything decent since. I'd love to make one in a blue and white stripe but like you, I'm tempted to just buy a ready-to-wear one instead! Its so frustrating, especially since there are breton stripes in practically every clothing store... where did they get the fabric and why can't I find any!? Your dress turned out great! Don't you love it when a 'first time' for sewing something new turns out successful - it really imparts the confidence to try again. As for your fabric question, you might be looking for ponte knit fabrics. I've also made some projects from an 100% cotton double knit, and it is pretty stable, not that drapey, but still very soft (hope this helps). Have you thought about buying a RTW item which has the breton stripes you are looking for and re-fashioning it? Sometimes I do this and buy the largest size to have more fabric...just an idea. Can't wait to see what else you make with knits! Great minds think alike. I have a fear for knit fabric, too. But I guess it wasn't as hard as I always thought :) I found it's hard to find Breton stripes as well. I spotted 2 remnant pieces in ponte knit recently and consider myself lucky. Your dress looks cute btw. It's so annoying, they're in every store! Starting with a super easy pattern was a nice way to ease myself into the wide world of knits, but I can see why they are so popular, this was practically instant gratification. Lovely! You're making me want a Coco dress now too! Thank you! It's a nice pattern, cute and easy! This is super cute! I think I'll have to make a Coco dress too in sweatshirt material for fall! What a cute dress! I'm so glad you've conquered your fear of knits! Sometimes Mood has St. James knits... might be worth calling the store! But I know they're some sort of poly blend, not cotton. Thank you! I am too. I'll be sticking to fairly stable knits for a while, but I am feeling much better about them overall. Thanks for the tip about Mood, I'm so jealous of those of you who live close by!